Loyola Scholars is a year-round, three-year academic and leadership achievement program serving middle school sixth-to-eighth-grade males in the Omaha metro area who are academically talented, have leadership potential and whose households have significant financial need. Loyola Scholars are prepared to be accepted and compete for scholarships at Creighton Prep and other top Omaha area college preparatory high schools. By nurturing gifts of the mind and spirit, Loyola Scholars strives to form young men of faith, scholarship, leadership and service, ready for a college preparatory education. Advance academically based on the standards of Creighton Prep curriculum. Be prepared for high-performance on the standardized HSPT® Archdiocese of Omaha Catholic high school entrance exam. Deepen faith through Christian values. Grow through physical education activities. Be mentored by professional adults and exemplary Creighton Prep students. Receive high school placement advising. 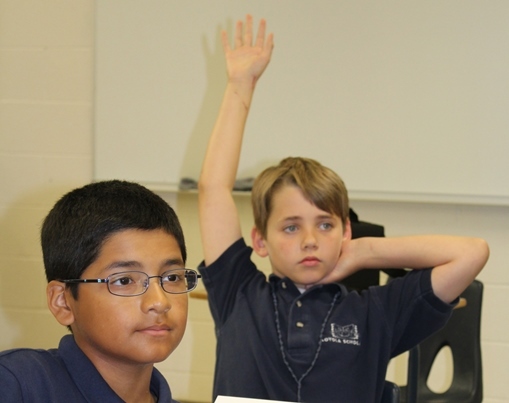 Four-week program of academic day sessions at Creighton Prep begins the summer before sixth grade and concludes the summer before eighth grade. Ten Saturday fall sessions and 10 Saturday spring sessions at Creighton Prep begin at sixth grade and conclude in eighth grade. Qualified educators and staff focused on the high academic and social standards of Creighton Prep. The team includes Creighton Prep teachers and alumni, teachers with experience educating gifted students, and high-achieving Creighton Prep students – who educate, inspire, support and care for all Loyola Scholars and their families. After successful completion of each year, scholars earn a pledge of $3,000 toward Creighton Prep tuition, accumulating to $9,000 upon eighth grade graduation. This, coupled with work/study, covers the full ninth grade tuition of scholars who are accepted and enroll at Creighton Prep. With successful completion of ninth grade, scholars continue to receive a full tuition scholarship as “Heider Scholars,” being evaluated each year and held to high standards. Nomination season opens in January 2019 at the beginning of the second academic semester. Nomination by elementary school principal, teacher, counselor, pastor or director of religious education, or the adult leader of another educational community-based organization. Submit application, official school transcripts, standardized test scores and household income verification. Scholars and families commit to full three-year Loyola Institute participation and special programming. Annual tuition of $100 can be paid in installments. All Loyola Scholars receive annual membership to the Boys & Girls Clubs of the Midlands. Click HERE to download the Loyola Scholars program brochure. *Admission to Loyola Scholars does not guarantee admission to Creighton Prep.